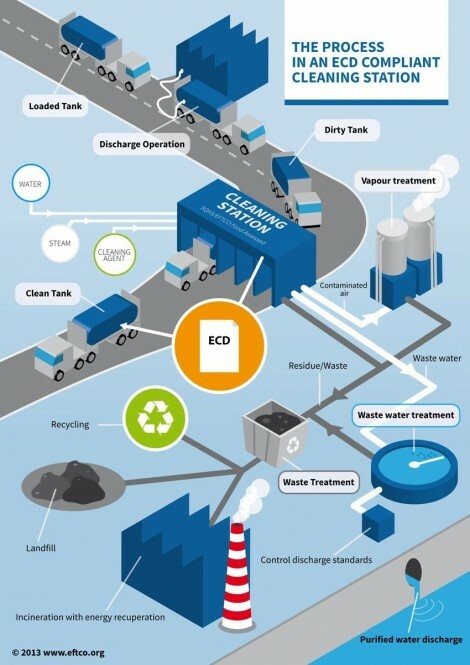 One of the major tasks of EFTCO is to promote the continuous improvement of the safety, environmental and quality standards of chemical tank cleaning operations in Europe in co-operation with ECTA and CEFIC as a contribution to their Responsible Care program. ECD, The EFTCO Cleaning Document is a support document for every single tank cleaning in the supply chain process. It is not a certificate but proves which cleaning steps have been performed. The uniform cleaning codes for describing these steps can be downloaded in several European languages in the download section. the EFTCO multilingual tank cleaning codes allow an easy identification of the operations that have been carried out. The ECD has been launched on July 1, 2005. It is a copyright of EFTCO which transfers this right under agreement to the National Cleaning Association. How ECD must be used, filled, filed and managed and a blank ECD form can be downloaded in the download section.